These images are cropped from a photo I found on the Library of Congress' website. 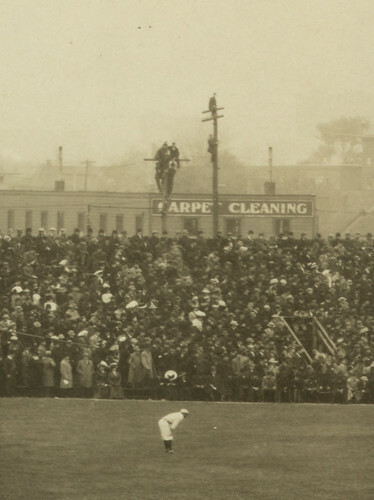 The panoramaic photo was taken at Bennett Park in Detroit during the 1909 World Series. What fascinated me is what you see in the background, fans perched on telephone poles in order to see the game. That can't be safe. You can view the original image here. There are several telephone poles with these funny little birds perched on them. These daredevils are just beyond the left field wall.